In "Ghosts of the Abyss", Ismay (Ken Marschall) leaves a virtually empty boatdeck and escapes in a lifeboat leaving 1500 people to die - but did it happen this way? An unbelievable calamity had ensued: the world awoke to news that the luxurious new White Star Liner, the Titanic, had gone to the bottom of the North Atlantic, taking 1500 people with her. The inevitable questions, recriminations and accusations broke in a frenzy, but fact emerged from the chaos, above all others. While prominent members of society were missing, presumed dead, one name was prominent. J.B.Ismay, the chairman of the White Star Line, responsible for the ship, was amongst the saved. How could he be safe when so many other men, women and children were now floating as ghastly frozen corpses off the Grand Banks? Ismay soon had a chance to defend himself. He was the first witness on the first day of the US Senate Inquiry into the loss of the Titanic, on April 19th, 1912, the day after the Carpathia had docked in New York. Senator SMITH: What were the circumstances, Mr. Ismay, of your departure from the ship? Mr. ISMAY: In what way? Senator SMITH: Did the last boat that you went on leave the ship from some point near where you were? Mr. ISMAY: I was immediately opposite the lifeboat when she left. Mr. ISMAY: The boat was there. There was a certain number of men in the boat, and the officer called out asking if there were any more women, and there was no response, and there were no passengers left on the deck. Senator SMITH: There were no passengers on the deck? Mr. ISMAY: No, sir; and as the boat was in the act of being lowered away, I got into it. Senator SMITH: Naturally, you would remember that if you saw it? When you entered the lifeboat yourself, you say there were no passengers on that part of the ship? Senator SMITH: Did you, at any time, see any struggle among the men to get into these boats? Senator SMITH: Was there any attempt, as this boat was being lowered past the other decks, to have you take on more passengers? Mr. ISMAY: None, sir. There were no passengers there to take on. So, in this benign story, Ismay saw the boat was being lowered, and there being no passengers in the vicinity, hopped in. There had been no struggle. It neatly corroborated Ismay's statement to the press, such as this one in "The Lewiston Evening Journal": "...I found that they were engaged in getting out the forward collapsibleboat on the starboard side. I assisted in this work, and all the women that were on this deck, were helped into the boat. They were all, I think, third class passengers. As the boat was going over the side, Mr.Carter, a passenger and myself got in. At that time there was not a woman on the boatdeck, nor any passenger of any class, so far as we could see or hear." And so Ismay's version of events was accepted as sacrosanct. 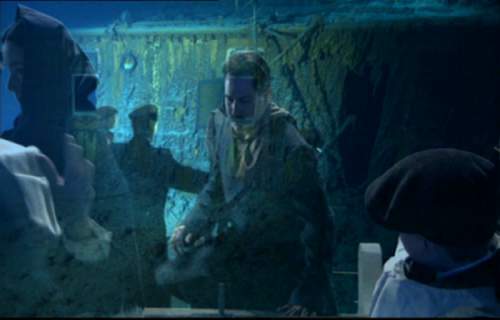 In the major depictions of the Titanic disaster on film ("A Night to Remember" in 1958, "Titanic" in 1997 and "Ghosts of the Abyss" in 2003), the escape was played out virtually verbatim as per Ismay's testimony, even allowing for some versions showing Murdoch scowling as the Chairman clambered into the boat. Mrs. Douglas stated to Mr. Randolph that the night was clear, and the sea calm, and that nothing was further from the minds of the passengers aboard the great vessel than disaster. She also stated to him that Mr. Ismay was one of the first men to take to the boats and that he had his boat crew miles away when the vessel went down. New York- April 19- According to Mrs. W.J. Cardeza, of Philadelphia, after she had arrived at the Ritz-Carlton with T.D.M. Cardeza, J.Bruce Ismay was not only safely seated in a lifeboat before it was filled, but he also selected the crew that rowed the boat. According to Mrs. Cardeza, Mr. Ismay knew that Mr. Cardeza was an expert oarsman and he beckoned him into his boat. Mr. Cardeza manned an oar until the boat was picked up about two hours later. "Then I saw the first boat lowered. Thirteen people were on board, eleven men and two women. Three were millionaires and one was Ismay." This story bears no relation at all to what others reported, although the rest of the account given seems reasonably in accordance with accepted events. The New York Times, who reported the above story, does not seem to be regarded as an unreliable source, and published it the day after the Carpathia's arrival. "The first boat" and the story of the millionaires may be journalistic license? In this article, an interview with Harry Senior is related, shortly after he arrived back in England: in the interview, Senior remarks that he saw the First Officer fire at two or three men who were trying to rush the boats. I don't think he killed anyone, for as far as I could see, he fired over their heads." It is likely that Senior was talking about boat C.
So, with these bogus claims dismissed, are there any alternate claims to Ismay's escape from the sinking liner? John Johnson, a member of the crew When J. Bruce Ismay, managing director of the International Mercantile Marine Co., stepped into the last lifeboat, Johnson said, there were no women left on deck. He was forced into the boat by officers of the ship and this was done, Johnson said, just as the boat was being lowered. A great story, but a quick look at the crew list reveals no "John Johnson" on board. There is a "James Johnston" listed, and he survived in boat 2, which was launched a little while before Ismay's collapsible C. Johnston, who was interrogated at he British Inquiry, was never asked about this. And, as we shall soon see, another occupant of boat 2 provides some corroboration for this story. But such stories cause problems: if it were true, why didn't Ismay use this "forced into a lifeboat" story to exonerate himself morally at the enquiries? Perhaps the answer is that, after the severe pillorying he received in the press, who would have believed him? "Weikman declares that he was a witnes of the scene when Ismay left the vessel and was literally thrown into the lifeboat by a seaman, who did not recognize him and though he was interfering with his work. He asserts that Ismay was striving valiantly to help in the work of launching the boats, and went overboard only under physical compulsion." Another seaman warned the first that he was speaking to the head of the line. 'I don't care who he is, he's got to get back or go overboard. We can't be bothered with him and his orders now', was the reply. Mr.Ismay stuck to his place and continued giving orders and directing the men. The rule was observed of sending over four women and then a man to look after them. When four women had been put over, the seaman turned to Mr.Ismay and ordered him over the side. Mr.Ismay refused to go, when the seman seized him, rushed him to the rail and hurled him over. I saw that muself, and I know that Mr.Ismay did not go of his own accord and that the charge of cowardice is unfair and untrue." One might question how so few men managed to escape in the boat if the ratio of women to men was 4:1. There seems to have been about 27 women aboard the boat, so there should have been 7 men. As it was, there were 4 men and 4 undetected stowaways. In describing the work of rescue Weikman was emphatic in declaring that J. Bruce Ismay, managing director of the International Mercantile Marine Company, who was among those saved, did not try to get into any of the lifeboats, and only took his place among the women and children when ordered to do so by one of the ship's officers. Did you see Mr. Ismay? Yes. I saw Mr. Ismay helping to load the boats. Did you see him get in a boat? Yes; he got in along with Mr. Carter, because there were no women in the vicinity of the boat. This boat was the last to leave, to the best of my knowledge. He was ordered into the boat by the officer in charge. I think that Mr. Ismay was justified in getting in that boat at that time. Ship's Head Barber Tells Camden Elks of His Thrilling Experience. "In loading the boats they aimed to put one man to every four women, and in this work Mr. Ismay lent valuable aid. Mr. Weikman says that the managing director of the company was attired then only in his pajamas and was barefooted. He gave orders quickly and coolly and did not go below to fully dress until after several of the lifeboats had been filled and lowered into the ocean. "There was no finer man on the boat than Ismay," said Mr. Weikman. "He is a brick, a white man, and did not get a square deal in the papers. He was in one of the last boats to be lowered because I was right there helping to get them overboard." Whether Weikman was pressed about Ismay in the question and answer session afterward is, sadly, not recorded. Senator SMITH. Before or since this occurred? Mr. LIGHTOLLER. On the Carpathia. Senator SMITH. En route to New York? Senator SMITH. Or after she had arrived? Mr. LIGHTOLLER. Before she arrived in New York. Senator SMITH. Give the information. Mr. LIGHTOLLER. It is that Chief Officer Wilde was at the starboard collapsible boat in which Mr. Ismay went away, and that he told Mr. Ismay, "There are no more women on board the ship." Wilde was a pretty big, powerful chap, and he was a man that would not argue very long. Mr. Ismay was right there. Naturally he was there close to the boat, because he was working at the boats and he had been working at the collapsible boat, and that is why he was there, and Mr. Wilde, who was near him, simply bundled him into the boat. Senator SMITH. You did not say that before? Mr. LIGHTOLLER. No; but I believe it is true, I forget the source. I am sorry I have forgotten it. Senator SMITH. I think in my prior examination in New York you said you entered the lifeboat from the A deck? Mr. ISMAY. From the boat deck, sir. Senator SMITH. And that at the time there were no other persons around; no women, particularly? Mr. ISMAY. Absolutely none that I saw, sir. Senator SMITH. Was that the last lifeboat or the last collapsible boat to leave? Mr. ISMAY. It was the last collapsible boat that left the starboard side of the ship. Senator SMITH. At the time you entered it, did you say anything to the captain about entering it? Mr. ISMAY. No, sir; I did not. I never saw the captain. Senator SMITH. Did he say anything to you about your entering it? Senator SMITH. Who, if any one, told you to enter that lifeboat? Mr. ISMAY. No one, sir. Senator SMITH. Why did you enter it? Mr. ISMAY. Because there was room in the boat. She was being lowered away. I felt the ship was going down, and I got into the boat. Senator FLETCHER. Did the tackle work all right? Senator FLETCHER. Did you have enough help from the crew of the Titanic? Mr. ISMAY. Oh, yes; they lowered the boat away. "At that time they were getting out the starboard collapsible boats. The chief officer, Wilde, wanted a sailor. I asked Capt. Smith if I should fire any more [rockets], and he said "No; get into that boat." I went to the boat. Women and children were being passed in. I assisted six, three women and three children. The order was then given to lower the boat. The chief officer wanted to know if there were more women and children. There were none in the vicinity. Two gentlemen passengers got in; the boat was then lowered." Senator BURTON. Now, tell us the circumstances under which Mr. Ismay and that other gentleman got in the boat. Mr. ROWE. When Chief Officer Wilde asked if there was any more women and children there was no reply. So Mr. Ismay came aboard the boat. Senator BURTON. Mr. Wilde asked were there any more women and children. Can you say there were none? Mr. ROWE. I could not see; but there were none forthcoming. Senator BURTON. You could see around there on the deck, could you not? Mr. ROWE. I could see the fireman and steward that completed the boat's crew, but as regards any females I could not see any. Senator BURTON. Were there any men passengers besides Mr. Ismay and the other man? Mr. ROWE. I did not see any, sir? Senator BURTON. Was it light enough so that you could see anyone near by? Senator BURTON. If I understand, there were firemen and stokers around in that neighborhood? Senator BURTON. But no women and children? Mr. ROWE. No women or children, sir. Senator BURTON. And, so far as you could see, no other passengers except Mr. Ismay and this other gentleman? Senator BURTON. Did you see Mr. Ismay and Mr. Carter get in the boat? Mr. ROWE. I saw the gentlemen get in; yes, sir. Senator BURTON. Did you hear anyone ask them to get in? Senator BURTON. How were you occupied at the time they got in? Mr. ROWE. I was occupied in attending the after fall, sir. Senator BURTON. Were you watching Chief Officer Wilde? Senator BURTON. Did you see him speak to them? Senator BURTON. If he had spoken to them would you have known it? Mr. ROWE. I think so, because they got in the afterpart of the boat. Senator BURTON. And you were in the afterpart of the boat? 17627. Later on were you saved in the starboard collapsible boat? - I was. 17628. And did Captain Smith tell you to go into it? - Yes. 17629. Were you told to take charge of it? - No, I was not told to take charge because I was in charge. 17630. Who got into that boat? - The boat was partially full when I got into it; I had 53 women and 3 children in the stern. Chief Officer Wilde was asking for more women. There were none forthcoming, and two gentlemen got in. 17631. Who were the two gentlemen who got in? - One was Mr. Ismay. 17632. And who was the other? - I never saw the man before. 17633. You do not know his name now? - Well, I know by the papers. The Commissioner: Let me know his name. 17637. How came it these two gentlemen came in? You said they got in. How came they to get in? - There were no more passengers in the vicinity to get in. 17638. Did anybody tell them to get in? - I never heard anybody. 17639. You did not hear anybody say, "Get into that boat"? - No. 17640. No Officer? - No. The only other corroboration for the "pushed in" scenario comes from a steward who requested anonymity when he arrived back in England on 28th April on the Lapland. In the Manchester "Daily Dispatch" of the 29th, it is noted that "It is definitely established, according to this witness's evidence that in spite of repeated calls for women and children, and none having appeared, it was only then, and when the boat was on the point of leaving, that Mr.Ismay was induced to go off in her her." Clearly, there certainly were people in the vicnity of the boat, although it does tie in with the "no passengers" statement. The boat deck, far from deserted as depicted in the popular media, must have been teeming with people, watching as one of their last chances to live was lowered away. "During this time [the firing of the rockets and the use of the morse lamp], they were turning out the starboard Englehart under the direction of Chief Officer Wilde and when it was full he was shouting out to know who was in charge then Captain Smith turned to me and told me to go and take charge. That was the last I heard Captain Smith say." "We had great difficulty in lowering as the ship was well down by the head and she took a list to port. It was then that I saw Mr.Ismay and another gentleman (I think he was a Mr.Carter) in the boat." "The Times published the following corroborating Ismay's statement: MR. CARTER'S STATEMENT (From our own correspondent.) Washington, April 22. Mr. William E. Carter, a well-known Philadelphian, gives the following story of his departure and that of Mr. Ismay from the Titanic. After seeing his wife and children into the boats on the port side of the vessel he went to the starboard side and there found Mr. Ismay with several officers filling boats with women. As the last boat was being filled they looked around for more women. The women in the boat were mostly steerage passengers. Mr. Ismay and myself and several officers walked up and down the deck crying "Are there any more women here?" We called for several minutes and got no answer. One of the officers then said that if we wanted to, we could get into the boat if we took the place of seamen. He gave us preference because we were among the first-class passengers. Mr. Ismay called again, and after we had no reply we got into the lifeboat. We took oars and rowed with two seamen. Again, the notion of a third party inviting Carter and Ismay into the board appears. The New York Times of April 22nd quotes Carter:"...I can only say Mr.Ismay only left the boat after he saw there were no more women on the deck. He called and so did I and we found none. I heard no shooting while I was on the Titanic, but do not know what happened after I left on the last boat." Mr. William E. Carter, of Bryn Mawr, who, with his family, was saved, confirmed Mr. Ismay's assertions. "Mr. Ismay's statement is absolutely correct," said Mr. Carter. "There were no women on the deck when that boat was launched. We were the very last to leave the deck, and we entered the lifeboat because there were no women to enter it. "The deck was deserted when the boat was launched, and Mr. Ismay and myself decided that we might as well enter the boat and pull away from the wreck. If he wants me, I assume that he will write to me. "I can say nothing, however, that he has not already said, as our narratives are identical; the circumstances under which we were rescued from the Titanic were similar. We left the boat together and were picked up together, and, further than that, we were the very last to leave the deck. "I am ready to go to Washington to testify to the truth of Mr. Ismay's statement, and also to give my own account at any time I may be called upon. If Mr. Ismay writes to me, asking that I give a detailed account of our rescue I will do so." "Come on, Mr.Carter, with me." The first officer was standing by with his pistol. "If you do get in that boat," said the Officer to Carter, "I'll shoot you." "But," protested Ismay, "they need men in this boat. Let him come." Mr Carter climbed into the boat thereupon and was saved." What can we make of this? Carter never mentioned such a scene and neither did Ismay. It is also difficult to understand where Mrs Ogden could have gleaned this information, as Ismay stayed in the doctor's cabin on the Carpathia for the duration of the journey to New York. As Tad Fitch writes, "Some less reliable press accounts attribute words to him suggesting there was a panic, which is completely at odds with his other statements, and which may indicate that his press interviews were tweaked by reporters for dramatic effect. For example, in the April 19, 1912 edition of the Washington Times, where he says that he saw passengers fired on by officers to stop a rush and that there was panic." 10390. When you got to the boat deck will you tell us what you saw? - I saw two babies on the deck; I picked them up in my arms and took them to the boat. 10391. Do you know what boat it was you took them to? - A collapsible boat. 10392. Was there any Officer there? - Yes. 10393. Who? - The Chief, Mr. Murdoch. 10394. Do you remember whether the collapsible was on the starboard or the port side? - On the starboard side. 10395. Did Mr. Murdoch give you any order? - Yes. 10396. What was it? - He told me to get inside with the babies and take charge of them. 10431. Were there any women or children on the deck in the neighbourhood of the boat when you left? - I did not notice. I never noticed at all. 10432. I want to quite understand what you mean when you say you never noticed. Do you mean that you did not see any, or you do not know whether any were there? - I did not see any women there at all. 10433. You did not see any women there at all; is that it? - Yes. 10434. That is in the neighbourhood of the boat, I asked you? - Yes. 10435. Did you notice whether there were any women and children on the deck at all when you left? - No. 10436. Do you mean you did not see any? - I did not see any. Not very illuminating with regard to the thrust of this essay, but it does provide some further corroboration that the boat deck was indeed devoid of women and children during loading and lowering. Note that Pearcey was never asked about crewmembers or male passengers nearby. Also note that he refers to Murdoch, the first officer, as being "the Chief"! Did Pearcey know that Ismay was aboard? If so, it might explain why he claimed that the number of people in the boat was an incredible and frankly unbelievable 71 persons - nearly double the calculated capacity (40). Did he have a reason to make the boat seem as "heroic" as possible - and thereby make the people responsible for filling her "heroic" too? 10520. Was Mr. Bruce Ismay taking any part in connection with that boat? - Yes, he was calling out for the women and children first. He helped to get them into that boat and he went into it himself to receive the women and children. Bruce Ismay told the court that Brown was mistaken and that he only entered the boat at the very last second. What about other passengers in the vicinity? What did they say about collapsible C's departure? It should be emphasised that some of the passengers below have not definitively been placed in boat C: lack of information has hindered such concrete conclusions. These should therefore be treated with caution. "[During the 1915 Limitation of Liability hearings], Mellors mentions the threatening with a gun occuring as the last boat lowered. It is not just speculation that the "last boat" he mentions was Collapsible C, either. Mellors is quoted in a 1912 memorial book saying he worked on freeing Collapsible A, which he was ultimately rescued in, and that he was near the last boat when it was lowered. He says he was washed overboard from the bridge, so this indicates he was speaking of Collapsible C. In Bob Bracken's ET article on Mellors , he documents that Mellors was near Collapsible C, and assisted at A as well, and the accounts there give many particulars of his escape. This is from the June 27, 1915 edition of the New York Herald: "According to Mr. Mellors, Mrs. Rose [sic- Rosa] Abbott, another passenger, was not permitted by the crew to enter an unfilled boat and saved herself by clinging with him to a collapsible boat. The witness said he saw officers of the Titanic threaten male passengers with revolvers to prevent them from entering the last lifeboat as it was lowered." [Note that this article and this one alledges that Rosa Abbott declined to enter the lifeboat and stepped back into the crowd: this latter article does mention an excerpt from an interview with a fellow survivor Amy Stanley, who says that "[Rosa] told me that she would get [sic] in the lifeboat if there hadn't been so many people around." And the forward boat deck was supposed to be empty!] The Pawtucket Times (May 22nd, 1912) quotes Abbott as saying that "at least seven women standing on the deck when the last boat was lowered from the rail." All these women slid into the water when the boat deck was inundated. One report this author has seen (but which has not been attributed to any newspaper interview) is that Mrs.Abbott was reluctant to enter the boat if it meant that she would be parted from her children. And from the same day's New York Times: "Because of the excitement on the part of the crew, he said, many persons were prevented from entering the boats. The witness clung for hours to a collapsible boat, which floated, although not in working order, until he was picked up...Mellors saw officers of the Titanic threaten male passengers with revolvers, to prevent them from entering the last lifeboat as it was being lowered." Unfortunately, the exact text of Mellor's court testimony has not survived. All we have are these fragments, but they do indicate a scrum at Boat C, that at least one woman was not permitted to enter the boat, and that men were threatened at gunpoint. And all the time, Ismay is safely ensconced in the lifeboat. Rosa Abbott lost her two children when the boat deck dipped under the waves minutes later. How accurate was Ismay's statement that he saw no women on the boat deck? Abbott might have been obscured in the darkness and crowd of the boat deck. Then again, Ismay did say he saw no passengers on the boat deck, which is demonstrably false. Also, unfortunately, the text of the letters in Bob Bracken's article do not mention anything untoward at Boat C. In fact, they do not mention this boat at all. PLAINFIELD, April 23---Miss Georgette Alexander Magill [sic - Madill], aged sixteen years, who was among the first of those rescued from the Titanic to be put aboard the Carpathia, yesterday at Plainfield defended J. Bruce Ismay, chairman and managing director of the White Star Line. She asserted that she saw Ismay get in the last boat, which was then but half filled, and that he did so at the solicitation of Captain Smith. She praised Captain Smith for his coolness and courage. This story is interesting for a number of reasons. Firstly, it was related by a passenger, who obviously had no axe to grind with Ismay unlike the Cardeza et al. account related earlier. Secondly, it mentions that Ismay was ordered into the boat by Captain Smith. One of the main points about the shooting on the boat deck in the final few seconds is that the passengers and crew were not familiar with the officers on the ship and misidentification was likely. Not so with Captain Smith. WIth his familiar grey beard, Smith was well known and admired. Its impossible that he could be mistaken for anyone else. "In a letter to his wife, D. W. McMillan, of Pleasantville, who visited New York last week to meet the Carpathia when it docked, in the hopes of securing some tidings of his sister, Mrs. Edward S. Robert, widow of former Judge Robert, of St. Louis, whom, accompanied by her daughter, Miss Georgette Madill, and her niece, Miss Elizabeth W. Allen, were saved, with other passengers, from the Titanic just before it sank, stated that his sister, who he met at the dock, related the story of the Titanics sinking, saying that she was in one of the last lifeboats launched, and that there was no disorder in the transferring of the passengers to the lifeboats. She said that Captain Smith was on the bridge the whole time up to the sinking of the ship, and that after he sunk [sic] with the ship he raised to the surface of the water, and the boat in which she was failed to reach him before he sank again. She said that Mr. Ismay and Mr. Astor worked together in assisting the ladies and children into the lifeboats, and after all of the women and children around were placed in boats, Mr. Ismay got into the last one cast off. My sister, Georgette and Miss Allen were taken off in one of the last boats with the fourth officer in charge, following his being commanded by Captain Smith to take charge of the boat ... She told me that Mr. Ismay and Mr. Astor were helping the passengers to get into the lifeboats until the last boat, and when no more women and children were around Mr. Ismay got into the [back?] of one ... There was no disorder during the whole thing." The ladies were placed in Boat 2, 4th Officer Boxhall's boat. How then could she see Ismay being loaded into Boat C, on the other side of the ship? Of note is the "no disorder" claim made in the letter. Boat 2 may have left with little or no disorder; the same is debatable for Boat C.
Bridget Delia Bradley (in "The Irish Aboard the Titanic" by ignoramus Senan Molony) was interviewed by the Daily Times whilst in hospital in New York after the disaster. She said that there was "no disorder on deck" and that "Just as the last lifeboat, the one with Mr Ismay in it, was launched over the side, one of the officers shouted 'Theres more room in that boat' and I and eleven other women were crowded into it.' 'The Lifeboat was lowered with enough men to care for it properly". Margaret Devaney's (3rd class) daughter related how, when Margaret arrived, the boat C was full, but two men climbed out and offered her their place. She may, as her grandson says, have been "thrown into a boat". (see http://www.sowashco.k12.mn.us/cgjh/Dept/English/titanic stories/DR.htm), a letter from Margaret Devaney in which she states, "I became caught in the crowd and was pushed into collapsible C." Indicating some form of tussle during the loading. Fireman Walter Hurst, writing in his 1955 memoirs to Walter Lord, mentions "a bit of trouble" in the loading of boat C. Hurst was helping to lower boat A from the Officers Quarters on the starboard side of the Titanic at the time. He saw the commotion and shots fired by "the chief officer," but said that he was not "near enough to see if anyone was shot." Admittedly, Hurst believes that this was at boat no.9, but this does not tie in with other evidence. A correspndent on the Encyclopedia-Titanica message boards (mike Findlay), mentioned "Just last month (April 2004), Mary Nackid's grandson told [Mike] that his grandmother, who didn't like to speak about the disaster, told him that she saw two men from Lebanon shot as she entered her lifeboat. She was so upset about it that she covered up her husband, who had managed to get in the boat with her, with her skirt. Other women covered him as well according to Mrs. Nackid." It is suggested that Mrs.Nackid escaped in boat C.
Emily and Frank Goldsmith Jr. encountered a line of seamen, with linked arms, only allowing women and children through. A kind hearted sailor was prepared to let travelling companion Alfred Rush, who had just turned 16, through too. But he said, "I am a man," and pulled back. A man managed to cross the chain of sailors and pushed in front of Emily but she pushed him back: as one account says, "if her husband could not accompany her, this dirty rat was not going to take his place! The sailors congratulated her for her bravery". In "The Grand Rapids Press" of April 24th, 1912, Emily said, "There was room in the boat but they would not let the men come...several of the men forced their way into our lifeboat, but the officers were firm and drove them back. Four chinamen refused to get out but crept down among the women and remained there..."
"You may have read about this man shooting negroes on board the Titanic. Folks, that was an absolute lie, because the man who was doing the shooting was only four feet away from little Frankie. And what was he firing? Not a rifle, a pistol. And in what direction was he firing it? Straight at the sky, as a warning, because as you could well imagine many people were learning that this was the last boat and they'd better get over there or else. And they were trying to rush to collapsible D to climb aboard it, and this was a warning to them. Keep back." Emily Goldsmith's story appeared in "The Detroit News" of April 24th, and it was reprinted in "The East Kent Gazette" of May 18th: "In the semi-darkness we ascended to the topmost deck and got into the lifeboat. It was the next to last to leave, and as near as I can remember there were about 30 women, five members of the crew and four Chinese in the boat besides my boy. Among those saved were two Italian women and a girl whose wailings were terrible to hear. The members of the crew tried in vain to get the four Chinese out of the boat, but they refused to budge and they had to let them stay. Just before the men above began to let the lifeboat down a number of Italians tried to get in, and it was only by firing revolvers in the air and threatening to kill them that they were kept out." [ As an aside, barber August Weikman said in a newspaper interview, "They put the women and the children in the lifeboats and then they started to put in the crew with them. One man to every five women. When no women were near the boats they took the men, whether they were passengers or crew, anybody who stood nearest, and this accounts for the three Chinamen who were taken off." Frank Goldsmith was undoubtedly mistaken when he claims to have escaped in boat D. I am grateful to Tad Fitch for pointing out that both Emily and Frank mentioned 4 Oriental stowaways in the boat, which were also mentioned by Rowe and Ismay. There were 8 such passengers on the ship - two perished, one was rescued from the water, and one escaped in boat 13. This accounts for the remaining four, therefore clinching the fact that she was in boat C. Boat D had no Chinese or Philippino men on board. 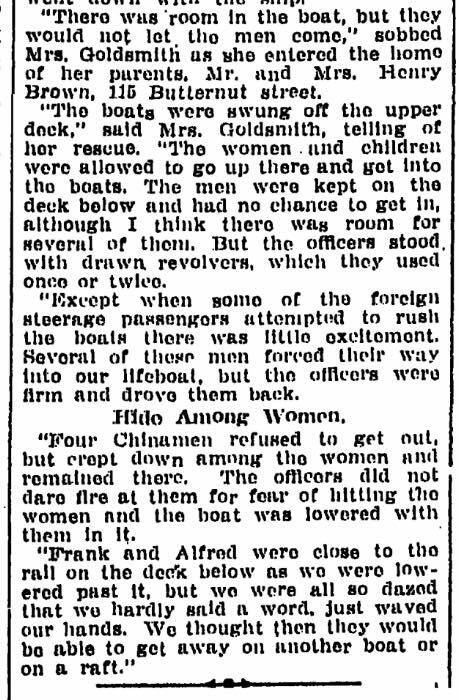 A newspaper interview with Emily in which she describes the Chinese stowaways, who were left in the boat for fear of gunshots hitting the women, can be found here. Another salient fact is that Emily also remarked on the boat catching on the rivets of the hull while it was being lowered the short distance to the water below. This ties in well with boat C; due to the large list to port, this boat would have rubbed along the hull, whereas the corresponding boat on the port side (D) would have hung a distance from the ship's side, which was indeed, noted. Regarding the Oriental passengers, there is one other minor mystery: as tad noted, "[Emily] said that when they were discovered, the officer in charge threatened the men, but didn't dare fire at them for fear of hitting the women." According to his testimony, Rowe did not notice the stowaways, who had been hiding under the thwarts of the boat, until daybreak. Another not an officer, Rowe was "in charge" of the boat. Was he armed too? Or were they, as hinted above, noticed to have crept in on the boat deck, but were allowed to remain? Senator SMITH. What happened then? Senator SMITH. Swarming into the boat? Senator SMITH. Was that into this collapsible boat? Mr. WOOLNER. It was a collapsible; yes, sir. Senator SMITH. That was the first collapsible that was lowered on the port side? Mr. WOOLNER. On the starboard side. That was the other side. Senator SMITH. You were across the ship? Senator SMITH. You were then on the starboard side? Mr. WOOLNER. Yes. We went across there because we heard a certain kind of shouting going on, and just as we got around the corner I saw these two flashes of the pistol, and Steffanson and I went up to help to clear that boat of the men who were climbing in, because there was a bunch of women - I think Italians and foreigners - who were standing on the outside of the crowd, unable to make their way toward the side of the boat. Senator SMITH. Because these men had gathered around this collapsible boat? Mr. WOOLNER. Yes, sir. So we helped the officer to pull these men out, by their legs and anything we could get hold of. Senator SMITH. You pulled them out of the boat? Mr. WOOLNER. We pulled out several, each. Mr. WOOLNER. I should think five or six. But they were really flying before Mr. Murdoch from inside of the boat at the time. Senator SMITH. They were members of the crew? Mr. WOOLNER. I could not tell. No; I do not think so. I think they were probably third-class passengers. It was awfully difficult to notice very carefully. I got hold of them by their feet and legs. Then they cleared out, practically all the men, out of that boat, and then we lifted in these Italian women, hoisted them up on each side and put them into the boat. They were very limp. They had not much spring in them at all. Then that boat was finally filled up and swung out, and then I said to Steffanson: "There is nothing more for us to do. Let us go down onto A deck again." And we went down again, but there was nobody there that time at all. It was perfectly empty the whole length. It was absolutely deserted, and the electric lights along the ceiling of A deck were beginning to turn red, just a glow, a red sort of glow. So I said to Steffanson: "This is getting rather a tight corner. I do not like being inside these closed windows. Let us go out through the door at the end." And as we went out through the door the sea came in onto the deck at our feet. Senator SMITH. You remained down there with your friend until the sea came in - water came in - on A deck? Mr. WOOLNER. On that A deck. Then we hopped up onto the gunwale preparing to jump out into the sea, because if we had waited a minute longer we should have been boxed in against the ceiling. And as we looked out we saw this collapsible, the last boat on the port side, being lowered right in front of our faces. "We then turned our attention to a boat ready on the starboard side, (Boat C, Ismays Boat) where there was shouting going on. We saw the first officer (Murdoch, at Collapsible C) twice fire a pistol in the air ordering a crowd of the crew out of the boat. We ran in and helped bundle the men onto the deck and then we got a lot, about ten, Italian and other foreign women into that boat and when we saw it was being safely lowered we went away and made a final search on the deck below." Compelling evidence for a major disturbance at Boat C? "I saw George Joseph, one of my cousins. He pushed me toward one of the lifeboats. Sailors armed with revolvers drove the men away from the boats shouting, "Women and children first! They shot into the air to frighten the men. Many passengers were overcome with fright...Banoura and I were placed into the next to the last lifeboat to be lowered from the ship. A scared young man leaped over the side of the liner and landed in the bottom of the lifeboat. Women shielded him with their night clothing so the sailors wouldnt see him. They would have shot him." Miss Emily Badman was also rescued in boat C, after having been led there by Edward Dorkings and another unnamed passenger. According to the Jersey Journal, which recounts Dorkings having helped her, they had to push through crowds to get to the lifeboat (C). Badman's own account was published in the Hudson Dispatch and it was repeated when she died in 1946; "I saw officers shoot some men who tried to get in lifeboats," she said, "and others fall into the water when they attempted to get into the already crowded boats." It is unclear whether she saw this while still on the Titanic, or after she had escaped. Miss May Howard said the following in the May 2, 1912 edition of The Orleans American and Weekly News: "One of the ships officers grabbed Mrs Goldsmith and myself and pushed us to the edge of the ship where the lifeboat was being filled with women and children. An officer there shouted, 'All men back, women come first." This account does imply that there were "men" in the vicinity. Further information comes from the 24th April 1912 issue of the "Rochester Democrat and Chronicle". Even though she mistakenly says that Ismay was not in her boat and that four people died of exposure while they were on the water, the above quote is appended with the following information: "There was no attempt of any of the men to get into the boat." "..we went to the starboard side of the boat deck. There was an awful crowd around the last boat of the forward part of the starboard side, pushing and shoving wildly....we thought it would never reach the water right side up, but it did." This corresponds with Woolner's account nearly exactly. It even ties in with Rowe's statement that the boat took 5 minutes to reach the water on account of the heavy list to port (the canvas sides of the boat were rubbing against the Titanic's rivets and every means available had to be used to push the boat away). This is an excellent account, but does not mention Ismay: after all, why should it? It was a private account to a grieving parent. No need to sully Ismay at all. There was no disturbance to speak of. The crowd was orderly. All the stokers and all second class and steerage passengers had come to the upper deck. Around the third starboard boat, from the bow, several shots were fired by Purser McElroy who was superintending loading, as one or two of the stewards jumped into the boat as it was being loaded. It was the only disturbance during the whole disaster. All the women and children had gone off into the boats. Any man was entitled to go into one of the last two or three boats as it was everyone for himself. Long and myself did not press our way into either of the last boats as it did not look as if they would reach the water right side up and we preferred to take our chances with the ship. Several new details are added here, including the location of the shooting incident. When the sixth lifeboat was prepared, there was a big crowd of men standing on the deck. And they all jumped in. So I said I would take my chance with them. [The men were] passengers and sailors and firemen mixed. There were no ladies there at the same time. When they jumped, I said I would go too. I went into the boat. Then two officers came along and said all of the men could come out. And they brought a lot of steerage passengers with them; and they were mixed, every way, ladies and gentlemen. And they said all the men could get out and let the ladies in. But six men were left in the boat. I think they were firemen and sailors. I was crying. There was a woman in the boat, and she had thrown her shawl over me, and she told me to stay in there. I believe she was Mrs. Astor. Then they did not see me, and the boat was lowered down into the water, and we rowed away out from the steamer. The men that were in the boat at first fought, and would not get out, but the officers drew their revolvers, and fired shots over our heads, and then the men got out. When the boat was ready, we were lowered down into the water and rowed away out from the steamer. We were only about 15 minutes out when she sank." Additionally, Buckley also says, "There was a girl from my place, and just when she got down into the lifeboat she thought that the boat was sinking into the water. Her name was Bridget Bradley. She climbed one of the ropes as far as she could and tried to get back into the Titanic again, as she thought she would be safer in it than in the lifeboat. She was just getting up when one of the sailors went out to her and pulled her down again." Bradley was in Ismay's boat, as we have seen. In a private letter, Buckley also said that, "An officer came along and said half of the men should come out of the boat, and let some ladies in. When I heard this I hid in the lower part of the boat." There is further evidence that corroborates portions of Buckley's story. Saloon Steward James Johnson was waiting at boat 2, on the opposite side of the ship to where "C" was hanging in the davits. He testified at the British Inquiry thus, "Mr. Ismay tried to walk round and get a lot of women (who were walking up and down) to come to our boat. He took them across to the starboard side then - our boat was standing - I stood by my boat a good ten minutes or a quarter of an hour...He took them across. There is about that height where my boat was, and he took them round there to the other side abaft the second funnel, I think." The women, for some reason, would not come into Johnson's boat. But Ismay taking the crowd at such a late time (the ship had less than 3/4s of an hour left to live) might explain why, when the men got into Buckley's boat, there were no ladies there at the time, as they were brought up later. This could be part of the crowd escorted by Ismay; a process of elimination allows us to deduce that the "two officers" who came along with the steerage passengers were Murdoch and Moody. However, as George Behe points out, no-one in boat "C" mentions seeing a man wearing a shawl in the boat, whereas there was in boat 14, which did have gunfire. There are some disrecpancies, of course: the question is still open regarding Buckley and his claims. "There was some disturbance in loading the last two forward starboard boats. A large crowd of men were pressing to get into them. No women were around as far as I could see. I saw Ismay, who had been assisting in the loading of the last boat, push his way into it. It was really every man for himself. Many of the crew and men from the stokehole were lined up, with apparently not a thought of attempting to get into a boat without orders. Purser H.W.McElroy, as brave and as fine a man as ever lived, was standing up in the next to last boat, loading it. Two men, I think they were dining-room stewards, dropped into the boat from the deck above. As they jumped he fired twice into the air. I do not believe they were hit, but they were quickly thrown out. McElroy did not take a boat and was not saved. I should say that all this took place on "A" deck, just under the boat deck." "We leaned over the side to watch the next to last boat being lowered...Apparently, for some seconds, there was no-one above directing the lowering of the bow and stern falls so that she might be held level. The bow was lowered so fast that the people were almost dumped out into the water." "We then went up a sheltered stairway onto the starboard side of the boat deck. There were crowds of people up there." So, Thayer's memory, 28 years on, places Ismay entering the boat from A deck! One of the few facts in this case is that we know Bruce clambered aboard from the boat deck. This little, often ignored passage makes one cautious about the accuracy of this anecdote. In previous accounts, Thayer had placed himself on the boat deck. It has been suggested that the lack of light on the boat deck hindered the search for extra passengers, particularly if one is at the foreward end of the boat deck, and possible evacuees are several hundred feet astern. However, with the light from the deck lamps, the gymnasium, the grand staircase entrance etc., it should have been possible to see some distance aft. Gracie notes that, after the "All passengers over to the starboard side" order, he went over to the rail on the other side of the ship and saw... "Somewhat of a crowd congregated". Mr.Thayer Snr. and Mr.Widener were there, looking over ship's gunwale and debating what to do. Gracie saw Mrs.Brown, Miss Evans and three more ladies. Collapsible D was being prepared for launch and Gracie frogmarched Evans and Brown to the boat. How could Ismay and all not see this "crowd", standing a few feet aft of their location. It seems unlikely, as does the notion of an empty boat deck. After the launching of boat C, R.N.Williams states that not many people were in sight on the foreward end of the starboard boat deck. The few who were there were either helping to lower boat A from the roof of the officer's quarters, or were debating the current situation. However, there were a few ladies (So said Edward Brown at the British Inquiry) in the vicnity. Note that this was well before Gracie saw his "mass of humanity" surge up from below decks. Where did these ladies come from? I should also point out that Hemmings, assisting with boat A saw one or two hundred people on the boat deck, but no ladies. "Unfortunately, apart from the official inquiries, very few people know the exact circumstances in which Bruce Ismay left the Titanic, as afterwards, rightly or wrongly his wife took the attitude that it was best forgotten, that it was bad for him to talk about it and she would never allow the subject to be discussed. There was one occasion, however, when he began to talk to his sister-in-law about his escape. He told her that one of the officers had urged him to get into the boat. There were no other passengers near, the boat was actually being lowered away and the officer had told him that he must go, as his captain would need his evidence at the inquiry which was bound to follow. That officer was Chief Officer Wilde who lost his life that night, and whose evidence if he had lived would have been or great value to Ismay. Bruce Ismay did not tell this story at the inquiries, however. Possibly he felt it would sound as thought he were trying to make excuses for his escape. This story is borne out by the affidavit of Weikmann, the barber in which he says he heard Chief Officer Wilde order Mr. Ismay to get in." And there we must leave it. With the mass of conflicting information, there is nothing more that can be said unless new accounts come to hand. It is up to the reader to make up his, or her mind, but it does seem that liberties with the truth were being taken by certain people: the overwhelming evidence is that there was indeed a commotion during the filling of boat C. Many accounts refer to shots being fired, but only one refers to anyone being injured or killed. One important point should be mentioned: in discussions on the Encyclopedia-Titanica board, author Sennon Molony, between vituperative sniping at anyone who's conclusions he disagrees with, mentions one salient point: Ismay was the first witness to be called at either inquiry; if he did decide at an early point to lie, then this was a dangerous gambit. He couldn't have known who would be called, and any number of people might have contradicted him at later stages of the inquiries. On the other hand, if he did decide to lie, then he must have known that he would be very foolish to alter his story later, with so much bile directed at him from the press and public. But there are a few other points that one needs to consider. The amount of resentment and indignation from passengers about Ismay's survival is an almost tangible quantity when one reads the immmediate post-disaster newspaper accounts. But did it work the other way? Were the crew afraid to portray him in anything other than a favourable fashion, lest they be blacklisted and never find employment? The International Mercantile Marine controlled a large swathe of the ocean-going business in 1912. So, the question still remains: did Ismay jump, or was he pushed? And if the latter, by whom? Did the ship's crew place Ismay's safety over that of any other man in the vicinity of the boat?